Under the presidency of Enrique Peña Nieto of the Partido Revolucionario Institucional (PRI), landmark structural reform laws (on energy, banking, telecom, fiscal and education) were passed in 2013-2014, despite the lack of a PRI majority in parliament. However, both President Nieto´s popularity and the credibility of the political establishment have severely suffered from public discontent over institutional defects, several major corruption and security scandals and the persistently high crime rate. It appears that Nieto´s political leverage will remain weakened until the end of his term in October 2018. Presidential and general elections are due to be held in July 2018, and the candidate of the leftist opposition, Andrés Manuel López Obrador, has benefited so far from growing anti-US sentiment. Developments since the November 2016 US presidential elections have confirmed that, due to its high economic dependence on the United States, Mexico is very susceptible to uncertainties about trade and investments with its Northern neighbor (esp. the future of NAFTA), and, to a lesser extent, remittances and immigration. 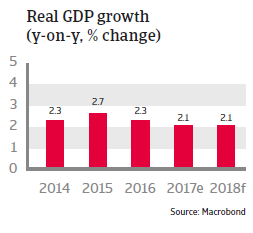 However, despite increased insecurity over US policies, decreased oil production and tight fiscal and monetary policies, Mexico´s economy performed better than previously expected, with GDP growth slightly above 2% in 2017. While the outcome of the NAFTA renegotiations still remains uncertain, Mexico seems to be quite resilient in dealing with this uncertainty due to strong economic fundamentals, underpinned by a sound policy framework, a healthy banking system, solid external balances and a flexible exchange rate. During the fifth round of talks in November 2017 progress in NAFTA renegotiations remained limited, as the US, Canada and Mexico remained deeply divided over substantial issues. The general expectation is still that Washington will moderate its most radical proposals and that negotiations will end with a revised NAFTA framework in the course of 2018. However, should NAFTA collapse, trade between the US, Canada and Mexico would revert to WTO rules (these rules set bands within which trade tariffs for different goods can be set). 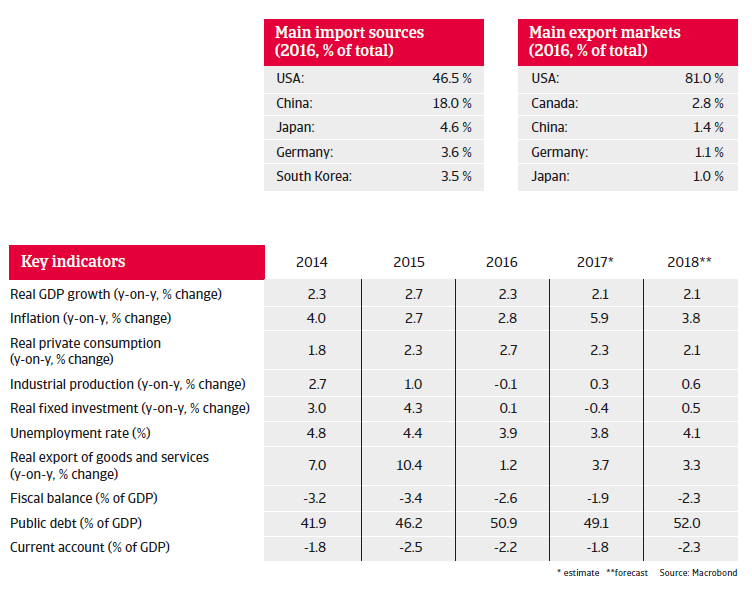 The economic repercussions on Mexico of such a scenario are expected to be manageable at least, given that the WTO tariffs on Mexico´s main export goods to the US would be rather low (e.g. on passenger cars it would be just 2.5%). Mexico´s twelve Free-Trade-Agreements with 46 countries would also contribute to risk mitigation. While the Mexican peso depreciated sharply in late 2016 and early 2017, it has largely recovered since February, only being interrupted by another short-term depreciation in the run-up to and following the fourth round of NAFTA talks in October 2017. 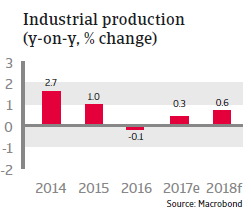 Depreciation, however, pushed consumer prices up to nearly 7% in 2017, beyond the Central Bank´s target band of 2%-4%. In order to protect the currency and to stem inflationary pressures, the Bank of Mexico has increased the benchmark interest rate several times – from 4.25% in July 2016 to 7.0% in June 2017. While rising consumer prices and monetary tightening impacted domestic demand somewhat, private consumption still grew above 2% year-on-year in 2017. At the same time export growth climbed more than 3.5% as, due to the exchange rate depreciation, Mexican exports have become less expensive in USD terms. 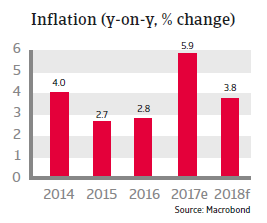 Inflationary pressures are forecast to decrease in 2018, while economic growth is forecast to remain static at around 2%, as both fiscal and monetary policies are expected to remain relatively tight and domestic confidence could be affected by uncertainty about NAFTA and political developments in the run-up to the July 2018 presidential and general elections. 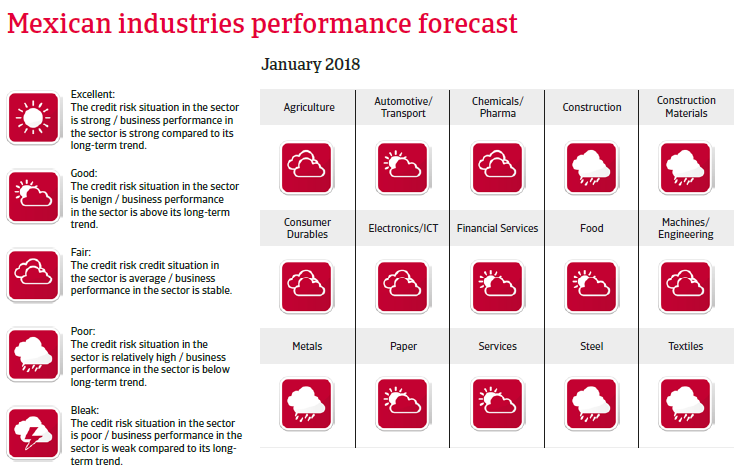 The short-term economic outlook remains afflicted with some uncertainty due to the elections ahead, the unpredictability of future US policies and the fact that the peso remains vulnerable to shifts in market sentiment (due to a high stock of inward portfolio investments and being the most traded emerging market currency). However, any steep deterioration of the economy seems to be rather unlikely. 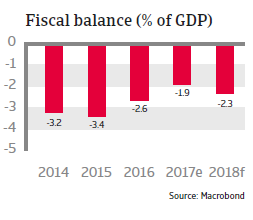 The solvency situation is quite good, and the government debt ratio is set to stabilise at around 50% of GDP in the medium-term, helped by improvements in the fiscal framework (higher tax revenues following a tax reform, and fiscal consolidation).The fiscal dependency on oil sales has decreased (the share of oil in government revenues declined from more than 30% to less than 20%) and the vulnerability to oil price declines is mitigated by fiscal reform and an oil price hedges. 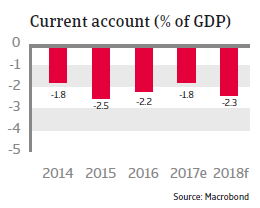 Moreover, Mexico’s resilience is underpinned by a flexible exchange rate and solid external balances, with limited external refinancing needs and abundant official reserves (more than four months of imports, abundant to cover 2018 external refinancing needs). There is additional liquidity potential from a precautionary IMF credit line of USD 88 billion, recently extended until November 2019, on which Mexico can draw in times of adverse global credit conditions. This reduces transfer and convertibility risks. Foreign debt ratios are under control, despite an increase since 2016 due to the peso depreciation and rising corporate debt. Authorities have pre-emptively covered external borrowing needs and are replacing existing bonds by new bonds on more favourable terms, while a new currency hedging programme means that the Bank of Mexico does not need to lift interest rates further in order to reduce pressure on the peso. This shows that Mexican policymaking is robust and should take some pressure off consumers and businesses alike. At the same time businesses are substituting foreign currency debt with local currency debt to reduce exposure to currency fluctuations. A well-developed financial sector and competitive advantages for manufacturing on non-US export markets should keep foreign investment up in the medium- to long-term. 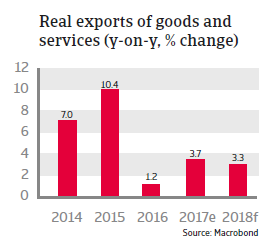 In the medium-term we also expect trade dependence on the US to ease as Mexico has renewed its focus on strengthening ties with the Pacific Alliance, Mercosur, and the EU, on top of the already existing free trade agreements. More needs to be done to tackle the poor domestic security linked to drug-related violence and rampant corruption, which severely affect the business climate and hamper economic performance by discouraging investment. At the same time, the profitability of many businesses has suffered from threats and violence against business owners, including the kidnapping of their family members. For a solid recovery of the country’s medium-term earnings capacity, Mexico would need to improve its law enforcement, the independence of the judiciary system and to overhaul police institutions. Trump’s threats to revise NAFTA and build a wall at the Mexican border could offer new trade opportunities for businesses in relations with Mexico.